Free Shipping Included! Fireproof Document Bag 15'' x 11'' Non-Itchy Silicone Coated Money Bag Fireproof File Box Small Fireproof Safe File Bag Waterproof Document Holder Document Storage Box Money Storage Document Case by Cool Carry at Transparent University. MPN: EM. Hurry! Limited time offer. Offer valid only while supplies last. ✈️ USES - Take your fireproof document bag with you to your next vacation or business trip, carry it to work every day, or just store your bag at home and have peace of mind knowing that your valuables are safe. ⛔ DOUBLE PROTECTION - Our fireproof money bag has not only velcro but also a zipper which makes it harder for the fire to get in. Because there is no such thing as being too safe! 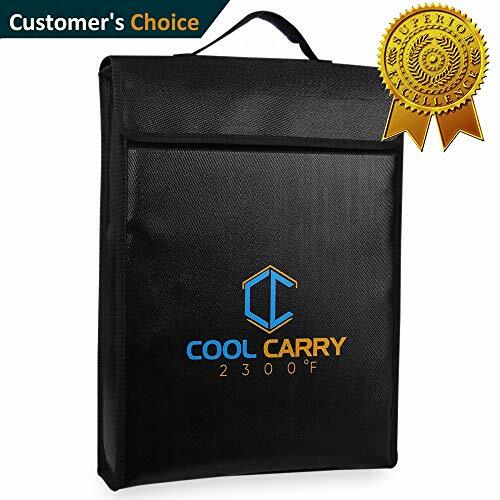 If you have any questions about this product by Cool Carry, contact us by completing and submitting the form below. If you are looking for a specif part number, please include it with your message.